Making simple pieces of jewelry can be easier than you think if you just know a few of the key materials and techniques. Over the past several months I've been sharing that exact information here on the blog as well as in videos on my CraftyHope YouTube channel. 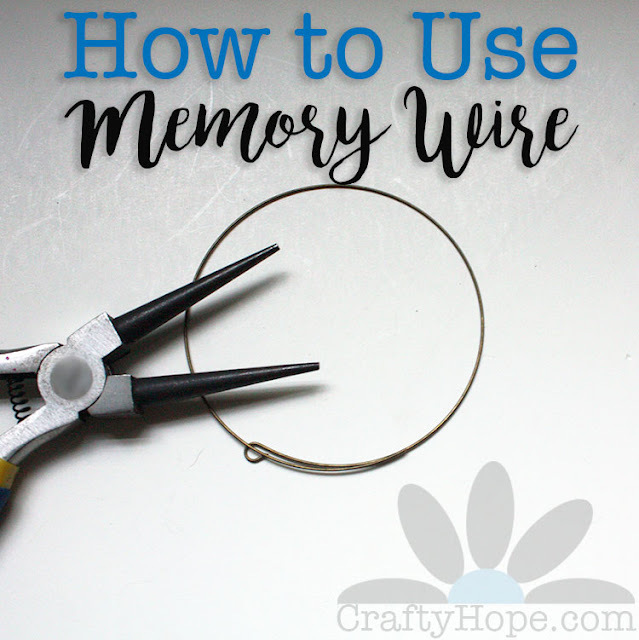 In this post, I'm sharing another basic technique that will help you make a completed piece of jewelry: using memory wire! Keep in mind that the wire is quite sturdy as it is made of steel, and you will want to use tools that are heavy duty enough to manage it. Your standard jewelry tools are often not made for memory wire and could be damaged by it. However, you need very few tools and materials to work with it. 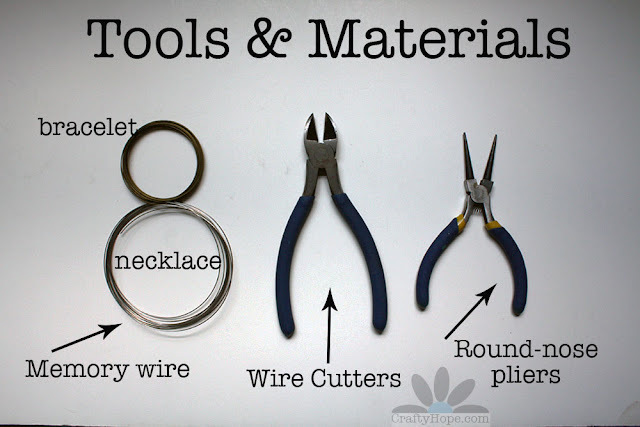 Along with your beads (not pictured), you will need memory wire in the size/shape you want, strong wire cutters, and sturdy round-nose pliers. There are tools that are designed specifically for working with memory wire, but I've found that the ones I've shown will work just fine too. To begin, you'll use your wire cutters to cut the memory wire down to the size you want to use. 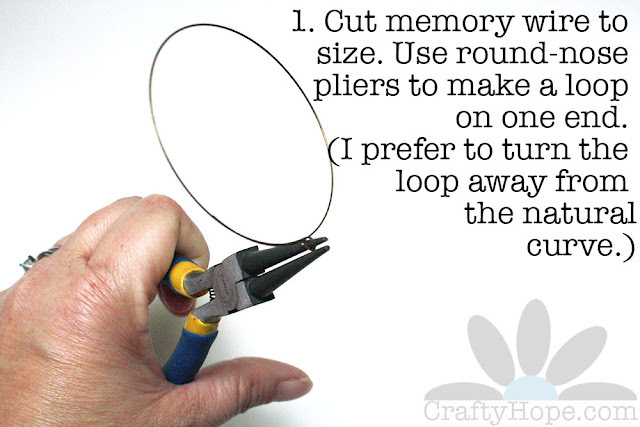 Then, use your round-nose pliers to form a loop on one end. Be aware of which way you form your loop. Once it's created, it is difficult to impossible to undo with memory wire. I prefer to turn my loop outward from the natural curve of the wire. However, it is perfectly acceptable to turn it into the curve. You'll want to curve your loop in the same manner when the piece is completed. If you prefer not to make the loops, there are bead caps designed to finish the ends of memory wire. Some of them glue onto the wire, some are screwed onto it. However, looping the ends is the method I use. 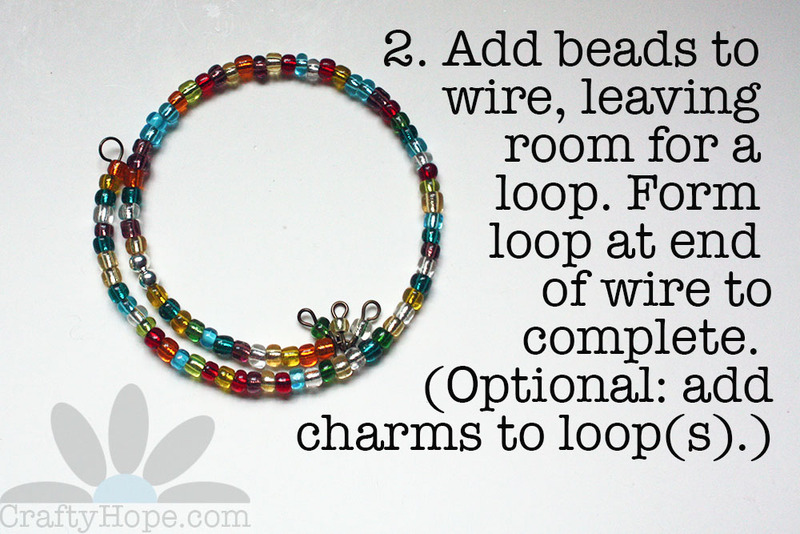 Once your loop is made, you can add your beads and other design elements. Make sure to leave enough wire at the end to create your second loop. It is important when you make both loops to ensure that the loops are completely closed so that your beads do not slip under them. From there, your piece is complete, but you may want to add charms to the loops to dress them up a little. You can see me walk you through the process of using memory wire in this video. This tutorial was the last of the jewelry techniques I had planned to review in this Jewelry-Making for Beginners Series. However, if there's a skill or technique you want to learn or watch me teach, please don't hesitate to let me know. From here, I was planning on beginning to share process videos of how I make some of my jewelry. But, I am more than happy to review any of these techniques or teach other ones. Just leave a comment! you should perhaps mention that cutting memory wire with your standard wire cutters will damage them - as memory wire is made from steel, it makes little nicks in the cutters. I keep an old pair specifically for memory wire. Wendy, I guess I only alluded to that instead of saying it outright. Thank you for the feedback! I'm off to correct that now. Thank you!